A fun board game designed to help develop and reinforce the ability to double and halve numbers. Players must take turns to roll a die and move along the board. 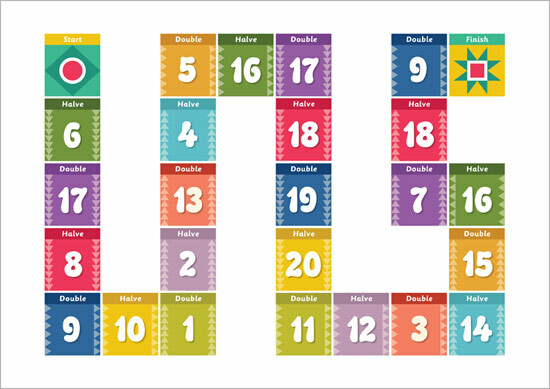 Each rectangle has a number which the player must either halve or double (depending on the instruction on the board) and say aloud. If they say the correct answer they can stay on the rectangle they landed on, but if they say the incorrect answer they must move back 2 spaces. The pdf includes an A4 version as well as a large version that can be printed out across 4 pages. You may wish to use one of the various dice templates available on our site in conjunction with this game. Hi this looks just what i am looking for with my grade ones.